The popular Long Borders at RHS Chatsworth Flower Show are returning for a second year, with more entries than ever. This year, our designers will take on the theme of the five senses, showcasing their interpretation through the art of horticulture and design. Discover the insightful and inspiring stories behind each border and take home plenty of ideas to spruce up your own borders. The Night Garden will explore how plants can be used to soothe the five senses and help us get a good night’s sleep. The design has been created to be calming for all hours, offering a soothing and magical view to those who are also sleepless at night. Designers Amy Lagnado and Alex Clarke will use a palette of peaceful blues in their planting, evoking a sense of calm. Soft grasses will drift through the design, gently whispering in the breeze. Herbs add the final touch to the border, specially chosen for their relaxing scents and properties. A touch of drama, designed by Paul Martin, Senior Gardener at Middleton Hall & Gardens, is a border that will stimulate your sense of touch, with a dramatic clash of tactile plants. Fluffy grasses and velvety foliage jostle with strap-like leaves and spiky flower heads. Mounds of fluffy shrubs and globes of hebe invite touch, while spiky, thistle-like bracts of the eryngium suggest keeping your distance. Muted, metallic silvery-blue foliage is splashed throughout with bold spikes of vibrant colour from lupins, echinacea and clouds of achillea. Belong is a border that has been inspired by designer Cath Fletcher’s childhood and the family gardens she grew up in. It will explore how plants and gardens can trigger fond memories and associations, creating a sense of belonging. Terracotta pipes and grasses designed within the structure of a double-helix will make a subtle nod to the structure of the DNA – something that spans the natural world, where we all belong. The effect that scent has over emotional wellbeing is being highlighted by Rachel Bailey and Nicola Sweeney in their design, The Healing Power of Scent. 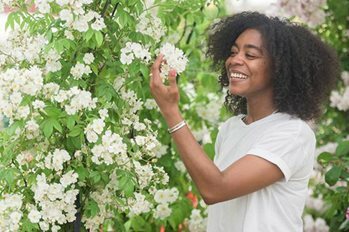 You'll be able to discover the positive effects of scent for yourself, with a border of gorgeous roses whose aroma is known to have uplifting and calming effects, nestled among naturalistic planting. A metal structure weaving throughout the border will symbolise a brainwave, reflective of the direct effect that scent can have on our minds. Jazz Ashworth is keen to encourage children to go outdoors in her Long Border, Inspiring Childhood Adventures. Inspired by fond memories of crawling through gorse bushes and playing with plants as a youngster, Jazz’s border is all about encouraging exploration and sensory development in children. Resilient, low-maintenance species will be planted in the border, providing plenty of take-home ideas for a family garden, whatever your space. We’re taking a dive underwater in Hidden Depth, a Long Border designed by Chen Zhu and Ziyao Liu. The two designers are exploring a freshwater aquarium planting scheme in their border, using plants that mimic aquatic species. Encased within a tank-like structure, the border will give a glimpse into an alien realm. The Long Border designed by Bev Williams and Toni Slater is a tribute to Deborah Cavendish, the late Dowager Duchess of Devonshire and features a willow and weathered steel sculpture of ‘Chatsworth Lady’ as the focal point. This romantic border has a planting palette full of perennials arranged to show the contrast in their shape, form, scent, texture and colour. The plants chosen are naturally suited to the local area around Chatsworth House, providing a habitat for native wildlife to flourish in. A Sense of Place has been based on the 250 schoolgirls who boarded at Chatsworth House for seven years during World War II. The planting reflects the journey these girls would have taken, showing feelings of uncertainty at the beginning before leading onto maturity after their experience at Chatsworth. Seven Taxus baccata hedges give the border a structural quality and represent the seven years that the girls lived there. Also hidden within the scene is a delicate wire sculpture of a young female, providing a visual representation of how the girls may have interacted with the landscape. Sensory Balance is a border that’s been inspired by autistic friends and family of the designers. Carlson and Stevens have used repetition, structure and a multi-sensory approach in their border to bring balance to the senses. This design was based on information from The National Autistic Society, which states that over or under stimulated senses causes anxiety in those with autism. The planting in the border invites you to stimulate multiple senses through touch, taste, listen, see and smell – bringing balance and offsetting the busy show. Return of the Senses is inspired by campaigns like RHS Greening Great Britain that aim to bring nature back to urban landscapes. The border, designed by Alfajri Rahmatullah and Emily Hull, aims to take you on a journey from the pioneering plants of brownfield sites to spaces that have been reclaimed by nature. The planting is bursting with colour and scent, representing a hopeful future where humans can appreciate all that nature has to offer. The Bess of Hardwick Border takes inspiration from another Derbyshire house, Hardwick Hall, and its grand dame, Bess of Hardwick, who played an integral role in the development of houses of the county including Chatsworth. Hardwick Hall is home to several walled borders, reflected in Victoria Philpott’s design with split hazel panels. Nestled in the border you’ll see a palette of purples, deep pinks and bursts of pale yellow, inspired by colours from several areas of the Hall's gardens. Herbs, providing structure in the border, reflect the famed herb garden. Mindfulness of Sounds by Ki Tong will explore how sounds, especially those heard in the garden, can help to encourage mindfulness and relaxation. The border is made up of a diverse range of columnar grasses and flower stalks that generate swishing sounds of movement as the wind blows through. Flowers, with colours chosen to appeal to pollinators, will draw the gentle buzzing of bees to the border. Metal plates and pipes will help to create additional calming sounds, as rain hits or winds blow through the border. Fade to Grey, a design by Mark Malaczynski, symbolises the gradual loss of sensory perception over time. The Long Border has been inspired by Mark’s personal experience of helping his mother as she ages. Over time, everyday life has become more challenging for Mark’s mother as she struggles with a decline in hearing, eyesight and her senses of smell and taste and touch. The planting in the border moves from the boldest, most vibrant colours of the spectrum, through pastel shades into a mono-chromatic, grey-scale scheme to convey a powerful message about the ageing human condition. A Flowering Concert has been inspired by a classical music concert, with the border visualising the sound of music. Key plants have been selected to represent musical instruments. Alliums reflect musical notes with their round flower heads, while ornamental grasses represent string instruments such as violins. Fumika and Jingyi’s design sees ornamental grasses lead the piece as the main melody, with other plants scattered in the border representing parts of a song that fade and develop throughout a piece. A small structure of a conductor stands watch over the border, directing the whole orchestra. Joanna Brinkman and William Scholey have taken inspiration from Chatsworth’s history for their border, The Haddonstone Garden: A Sense of Heritage. Immersed in the wildlife-friendly planting, you’ll see a bust of Capability Brown, who famously redesigned the landscape at Chatsworth in the 1700s. Next to Brown will be pineapple obelisks, reflecting head gardener Joseph Paxton’s successful pineapple-growing ventures at Chatsworth in the 1800s. The colourful and fragrant planting in the border has been designed to encourage the gentle hum of bees and insects, providing stimulation for our eyes and ears. Key pieces of Haddonstone will be immersed within the border, adding a tactile element to the design. What's happening at the show in 2019.